Nine years have elapsed since the end of war in East. Still, the occupying military of genocidal Sri Lanka is controlling freedom of movement in the interior north-western hinterland of Batticaloa district, which is known as Paduvaan-karai. The SL Army personnel manning a check post at Kiraan Bridge are refusing entry to civilian vehicles at random. The Community Based Organisations and Non-Governmental Organisations visiting the area are being redirected to Welikanda military base (Polonnaruwa district) with the instruction to secure permission to their entry into Paduvaan-karai in Batticaloa with a pass document. Around 5,000 Tamil families live in the area which comes under Koa'ra'laip-pattu South (Kiraan) division. A significant number of these five thousand Tamil families are dependent on agriculture in 18 Ka'ndams of their paddy lands (Ka'ndam is a Tamil term commonly used in Batticaloa and in Vanni to mean a block of paddy field). The SL military and SL Mahaweli Ministry, led by SL President Maithiripala Sirisena, are also diverting irrigation water away from reaching the agricultural farms owned by Tamils. The diverted water is being channelled to Sinhala and military-run farms in Polonnaruwa and to the tourism industry operated by Sinhala businessmen in Paasikkudaa. The people living in the area also complain that medical organisations coming to their village to provide health care have been returned by the occupying military on some occasions. During the times of the LTTE, Thileepan Medical Service, based at Koozhaavadi, was attending the basic medical needs of the people. Now, the people have to travel more than 15 km to reach Vaazhaichcheanai hospital. Their main means of transportation is bicycle. Likewise, they are also deprived of other basic infrastructure facilities. One could clearly observe the contrasts in prejudice and discrimination by comparing the infrastructure, star-class accommodation to the visiting and encroaching Sinhala colonists in the same division, particularly at the environs of Kudumpi-malai (Baron's Cap). At the same time, the SL Ministry of so-called Mahaweli development has been responsible for ethno-centric structural genocide against Eezham Tamils, particularly from Batticaloa in the East to Mulaiththeevu in North, along the hinterland of eastern coast. 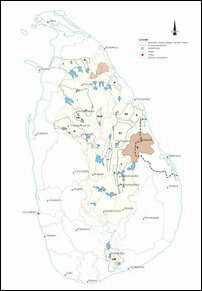 In the first phase, the System B of Mahaweli scheme targets to divert the waters to Sinhala farmers in Welikanda and Dimbulagala D.S divisions in the Polonnaruwa district, which is the home electorate of Maithiripala Sirisena. Eezham Tamil farmers and fishermen in Batticaloa, facing the crisis will be forced to move away from their areas and the next phase of so-called agricultural expansion under the System B will be target Sinhalicisation of agricultural areas in the hinterland of Batticaloa district, say Tamil farmers who are dependent on irrigation channels from Vaakaneari and Vadamunai tanks.